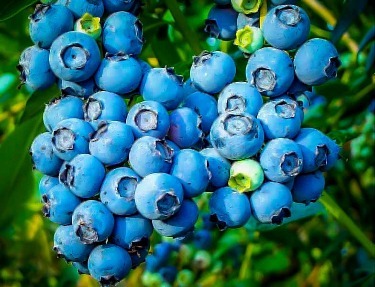 How to Grow Berry Bushes – What Ones Should I Grow? Home Fruit Trees How to Grow Berry Bushes – What Ones Should I Grow? Fresh fruit is one of the great pleasures of life, and home-grown is always superior in just about every way. But growing fruits like peaches, pears, and even apples is not easy, and those trees take up a lot of space, while gardens get smaller and smaller. But there are other types of fruit that not only take up very little room, but that are easy to grow too. These are the berry bushes, or ‘soft fruits’, as they are sometimes called. Instead of a big tree you have a plant that is just a few feet tall. Some of them can be grown on a wall or fence, taking up almost no room at all. If you want to grow fruit, and especially if you have never done it before, rather than going out to plant apple trees, which will be years producing a crop, start with berry bushes. The year after you plant you will be harvesting, and because these fruits have to be hand-picked, they are always expensive at the grocery store, and a special treat. Fruit like apples are often cheap, so the economic benefits of growing your own is almost no-existent. 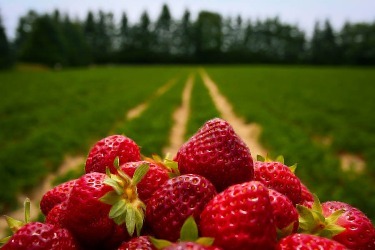 With berry bushes, you will be amazed at how much you can harvest, and the saving is substantial. Think of the berries you like – blueberries, strawberries, blackberries, raspberries and more. All of them can be grown at home in limited space, and easily too. Let’s look at the basics of choosing and growing them, starting with the easiest ones. 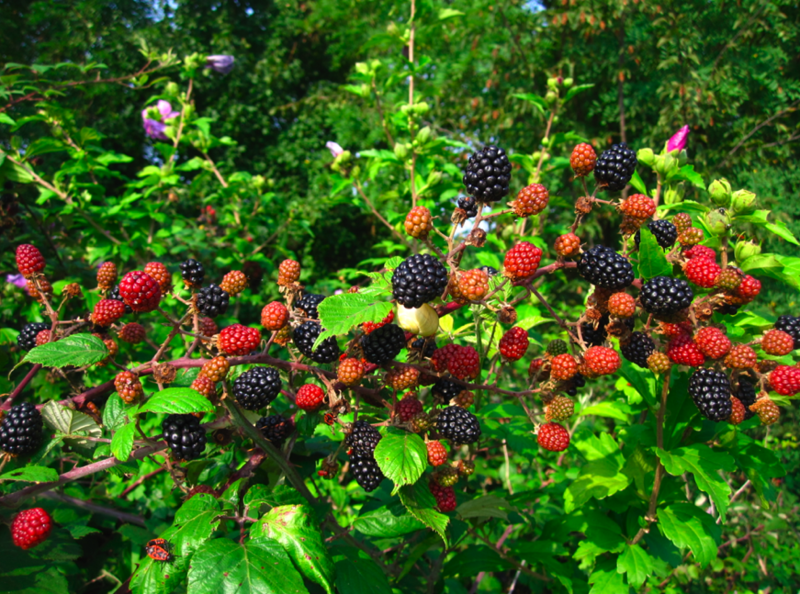 When we say ‘blackberries’, you might think of those wild, thorny bushes that come up in neglected areas. They form a vicious tangle, and the berries are small and sour. No, when we say ‘blackberries’ we are not meaning those ones. Instead, for the garden, there are thornless varieties that produce huge berries that are sweet and juicy. These garden blackberries are our top-pick for the home garden, and here’s why. First, they are self-pollinating, so you don’t have that issue that creates so many problems for fruit growing, and that involves growing just the correct pair of varieties to give you a good crop – if you can find them to buy. 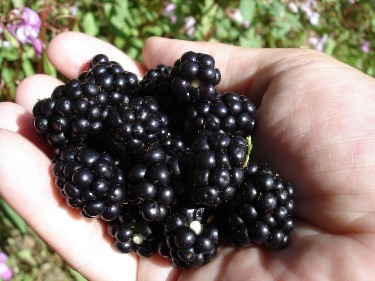 Instead, just one blackberry bush will produce a huge crop and take up very little room. The standard way to grow blackberries is on a sunny fence, bending over the branches and tying them down as they grow. If you don’t have a suitable fence you can run two wires between some posts, and then tie them to the wires. They take up very little room this way, but today there are even varieties that will stand up without any support – what could be easier. Look for names like ‘Navaho’, ‘Apache’, ‘Arapaho’, ‘Natchez’ and ‘Ouachita’ when choosing plants. These are all modern thornless plants with huge, sweet and tasty berries you will love to eat fresh or cook into muffins and pies. These delicious berries are so popular – and doctors say they are very healthy too. They are packed with antioxidants, that protect us against many disorders. No wonder they are popular, because they are so versatile. Eat them fresh, put them into pancakes and muffins, or bake them into pies. Whatever way you eat them, everyone in the family will love them. Many fruits create gluts, with too much to cope with over just a couple of weeks, so a lot is wasted. The only solution is tedious canning and preparing to keep them for longer. Not so with blueberries. The great thing about growing these at home is that you just toss them into a bag – no washing is needed – and pop them into the freezer. What could be easier? Just take them out and use them still frozen – not a berry is wasted, no matter how little time you have. The main need for blueberries is the correct soil – this has to be acidic, with a pH range of 4.5 to 5.5 or perhaps 6.0. The dwarf variety ‘Sunshine Blue’ is a little more tolerant of neutral soils, but if you don’t have the right soil, the best approach is to use large boxes or planters, and put your bushes into potting soil for acid-loving plants, and also use acid-loving fertilizers. Steady watering is also needed, and a simple winter pruning to keep bushes productive for years. There are three main groups of blueberries, northern highbush, southern highbush, and rabbiteye. The last one is good in moderately warm to hot areas, and southern highbush for places with warm winters, like Florida. For cooler areas, use the northern highbush types. Make sure to match your chose to your climate zone, or you may not be successful with this plant. These delicious red fruits are close relatives of blackberries, and just as easy to grow. There are even varieties with golden fruit, for a welcome change of pace. Mostly they need a frame as suggested for blackberries, and the same pruning – take out the old canes as soon as they have been picked over, and tie in the new ones for fruit next year. Otherwise you will end up with a prickly tangle, that is hard to pick, and produces poorly. 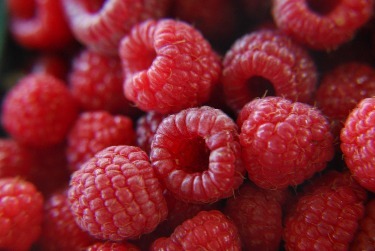 Less versatile than other fruits, raspberries are still delicious, and very worthwhile to grow at home. This is a fruit that doesn’t really grow on a bush – it’s a low-growing perennial plant that makes a clump of leaves. In some ways they are the easiest of fruits, and give big yields, but they take more attention and time to grow properly over a long period. New plants will give lots of delicious berries, but after a couple of years they become old, tangled, and only produce tiny fruits. The answer is to grow them in a rotating system, using three patches. Start the first patch with new plants and do something else with the other patches for the early years. Collect young plants from the long stems that are produced after flowering, and plant these in patch two in the fall. Do the same the following year. The next year, dig up the plants from patch one after the berries are harvested, dig over the bed and manure it. Then replant it in the fall with new plants from your other plants. Keep rotating the beds in this way, so that the oldest plants are three years old. First year plants give a small quantity of big, high-quality berries. Second-year plants give a big crop of medium berries. Three-year plants give a big crop too, but the berries are small, and ideal for jams and preserves. This system will keep you in strawberries for years, but as you can see, it does take organization and work. Whatever berries you choose to grow, you will be amazed at the crops you harvest – berry growing really is a worthwhile gardening activity.